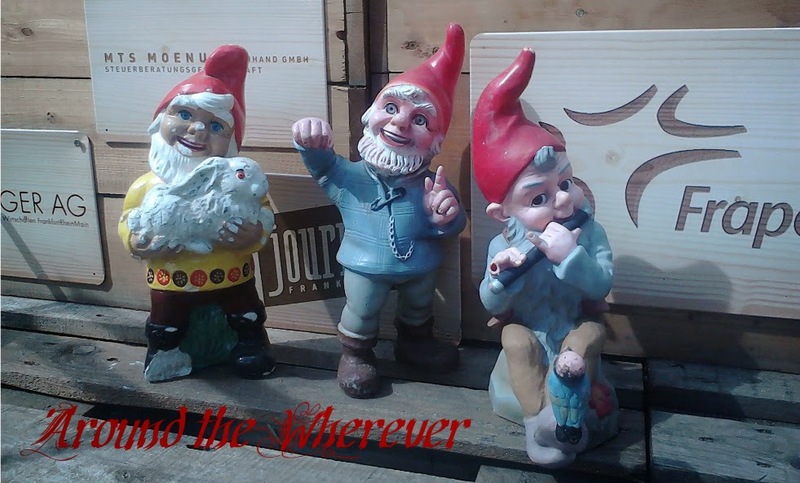 Around the Wherever: My week: September 4 ed. Man, was I tired at the beginning of this week. Even though I wasn't sick from allergies, which have been mostly held at bay thanks to an aggressive daily routine of allergy pills and maintenance breathing steroids, my immune system still freaks about goldenrod and other allergens. I kept wondering why I was so tired but when I saw the goldenrod, I figured that must be the reason. I haven't been sleeping well because of congestion and also since my bedroom gets too hot. If I leave the rolladen up for air flow, then there's too much light coming into my room. If I leave them down, then the room gets stuffy. I turn on the fan and then I'm too cold. The whole thing is a bit ridiculous. I met with my tandem partner and for the second time, followed her recommendation where we'd each speak our target language the whole time. I managed to work my way through a complex sentence, complete with relative clauses and multiple ideas, and I did it right. Yay! It's easy to get lost in German sentences, especially when using subordinating conjunctions and relative clauses. After watching out for verb order and keeping an eye out for splittable verbs, by the end it feels as if one has come up for air. Another night, I invited my friend Ay. and her sister over for dinner. Ay. is from Pakistan and wanted to try to macaroni and cheese because "it's what single dads always make for their kids in American movies." She is always cracking me up and I tumbled into a heap of giggles over this reasoning. I bought Kraft Mac n' Cheese because she wanted the typical kind. Both gals liked it. Heck, I like it, as low-brow as it is, but mostly avoid it because the wheat in it gives me a headache. 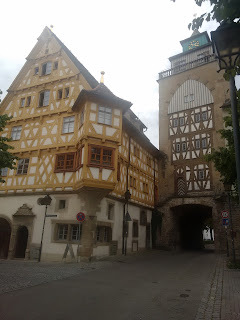 During the weekend, I took a trip to the Stuttgart region. My friends C+K, who had previously lived in Neustadt, moved there. While I'm sad that they're no longer an easy 30-minute train ride away, I'm still glad to be in contact with them and the Stuttgart area does have some interesting activities. On Saturday, we spent some time at their new apartment then started our journey to Tübingen, a university city about half an hour away. On the way, we stopped at C's parents' house to drop off some things. We were just in time as his mother, R, had just put a pizza in the oven. I've stayed there last year with C+K during C's annual garden party, so it was a nice reunion. My German has improved so much even since then so it was nice to talk more with C's father, who doesn't speak as much English. 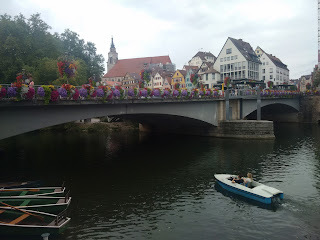 After that, we drove to Tübingen and wandered around the city. More will follow about this trip, as a separate blog entry, but below is a picture of how pretty it is. I'm a sucker for cities with bodies of water. The next day, while C did some work around the house, K and I visited the Keltenmuseum Hocdorf/Enz in Eberdingen. 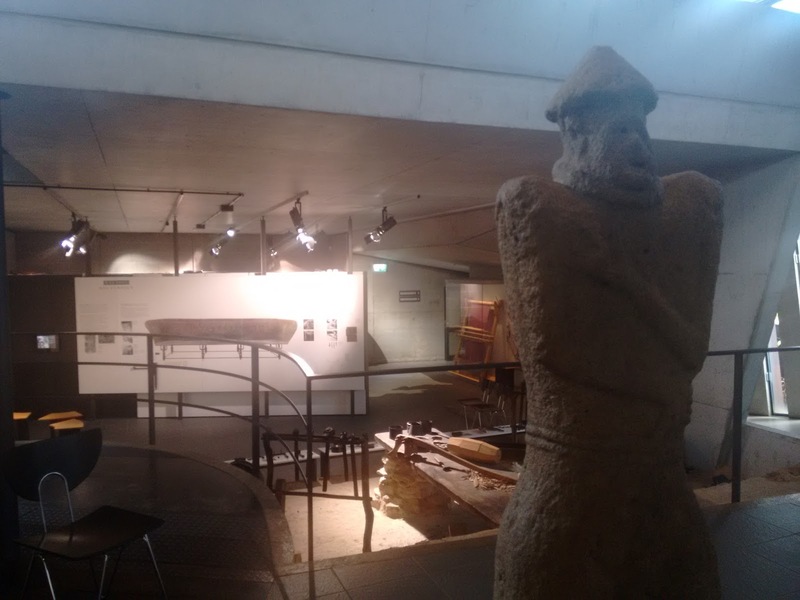 It's a museum dedicated to the Celts who lived in the area and includes artifacts from the grave site there. Entry was 5 euros and we spent about an hour there, looking over the exhibits. Most parts are in both English and German but the last third of the museum was only in German. As we were leaving, I saw a sign for a free museum in the neighboring town of Markgröningen and we decided to visit. The Wimpelinhof Museum is sparse but offers some information about the local sheep herding traditions. K and I were very sad to learn that by a week, we had missed the annual herders' festival, where women wear Tracht and run races with water buckets on their heads, among other things. I would have been keen to view the former as I enjoy strange traditions. After we wandered around the city a bit more, ate ice cream, and got rained on, we cut our visit to Markgröningen short. It's a shame because the town is quite lovely, full of historical fachwerk buildings. However, we didn't bring umbrellas and didn't feel like standing around in rain so we went back to their house. For dinner, I cooked raja masala, which they enjoyed, and then I drove home, content after catching up with some good friends.